Animal owners in London, Surrey and West Berkshire are being alerted to look out for and report an insect pest which can cause health problems to them, especially during spring and summer, typically from May onwards. 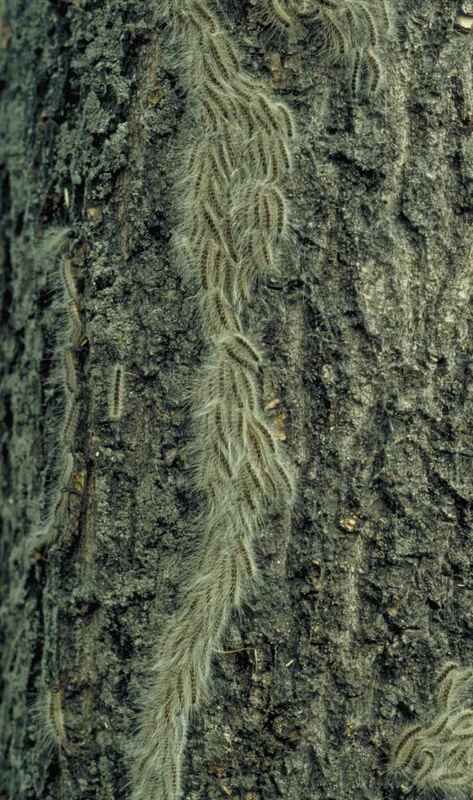 People, too, can develop rashes and eye and throat irritations from exposure to caterpillars of the Oak processionary moth (OPM), an exotic species which was accidentally introduced 11 years ago. It is possible that it will be found in southern parts of Hertfordshire and Buckinghamshire this year. 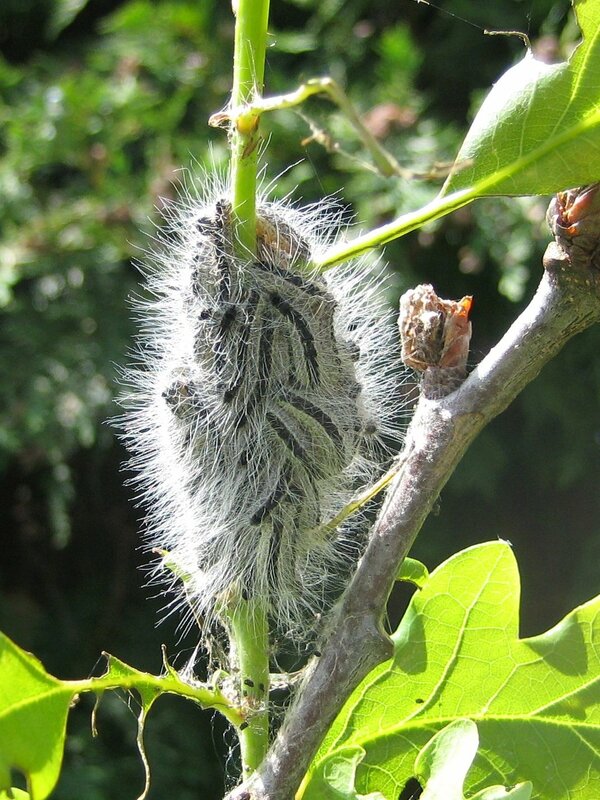 OPM is a tree health pest because its caterpillars, moving about in nose-to-tail processions, feed on oak leaves. In large numbers they can strip oak trees almost bare, weakening them and making them vulnerable to threats such as disease and drought. They are also a human and animal health hazard. The caterpillars – the larval stage of the insect’s life cycle – have thousands of tiny hairs which can become detached and blown about by the wind. The hairs contain an irritating substance, called thaumetopoein, which on contact with people can cause itching skin rashes and, less commonly, eye, ear and throat irritations and breathing difficulties. The hairs can be blown by the wind, and they build up in the caterpillars’ silken webbing nests, which they build on the branches and trunks of oak trees in May and June, sometimes at ground level. Nests sometimes fall to the ground, and the caterpillars sometimes descend to the ground, posing a risk to inquisitive animals such as cats and dogs, grazing animals, and playing children. The Forestry Commission is leading efforts with councils and major landowners to minimise the spread, population and impacts of the pest in a Defra-funded control programme. Andrew Hoppit, its OPM project manager is encouraging anyone who spots affected areas to help their control programme by reporting sightings using their online Tree Alert reporting tool. In Surrey: Elmbridge, Epsom & Ewell, Guildford, Spelthorne and Woking. In Berkshire: West Berkshire, Windsor & Maidenhead. In London: Brent, Bromley, Camden, Croydon, Ealing, Greenwich, Hackney, Hammersmith & Fulham, Haringey, Harrow, Hillingdon, Islington, Kensington & Chelsea, Kingston Upon Thames, Lambeth, Lewisham, City of London, Merton, Newham, Richmond Upon Thames, Slough, Southwark, Sutton, Tower Hamlets, Wandsworth, Waltham Forest, and City of Westminster. Those who think their animals have been seriously affected should consult a vet. The effects of OPM contact on people, although unpleasant, are not usually medically serious and pass in a few days. People who have been affected should consult a pharmacist for relief from the symptoms, or a doctor for serious allergic reactions, although these are rare.